This week I annoyed the quartet by asking them if we could start programming next year’s pub concerts. (Sorry guys!) This is way ahead of when we usually do it, but there was an application due soon that needed that information. As a result though, I’m SUPER EXCITED about what we have lined up for next year! 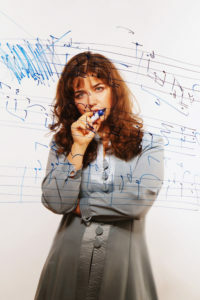 One awesome piece we’ll be playing is Lera Auerbach‘s piano trio, written in 1992. I had the pleasure of working with her on her piece for mezzo-soprano, cello and piano, Last Letter, when I was still a doctorate student at University of Michigan, and fell in love with her darkly passionate melodies and her intense emotional intelligence. Since she might be a new name for many of you, I thought I’d give you a few fun facts about her. She has a teacup dog. As one of the visiting composers-in-residence at University of Michigan, she would carry around this dog everywhere she went, under her arm, whispering and kissing it between coachings and rehearsals. It was very cute, and complemented her own diminutive stature. The titles of these books give me immediate book lust: Aphorisms and Artworks, Essays on Music and Literature, Hannover Notebook: Selected Poetry and Prose, Sorokolunie (Forty Moons): Poetry and Prose 1984-1994, Stairs To Eternity: Selected Poetry and Prose, Excess of Being. Composer/Pianist/Poet/Author – I guess this woman doesn’t sleep. She also is an artist! Many of her works have this captivating creepiness. Absolutely visceral. Gnarled, emotive, and you can’t look away. Composer/Pianist/Poet/Author/Artist…maybe she’s also an inventor and found a way to put more hours in the day or something. When she first moved to the US to study that she couldn’t afford subway fare, so she just walked 100 blocks to school. That’s 10 miles of walking everyday. NO BIG DEAL. I mean, I love walking in NYC, but this is pre-ipod or podcasts. Maybe that’s why she’s so fiercely self aware – so much time to reflect.